Designed for agility, the Dynafit Racing gloves are made from Polarlite® DYNAstrech, a polyester / spandex blend that is form fitting yet very flexible. They also feature a soft chamude front which, combined with special silicone printed zones in the fingers and upper palm, offers excellent grip. 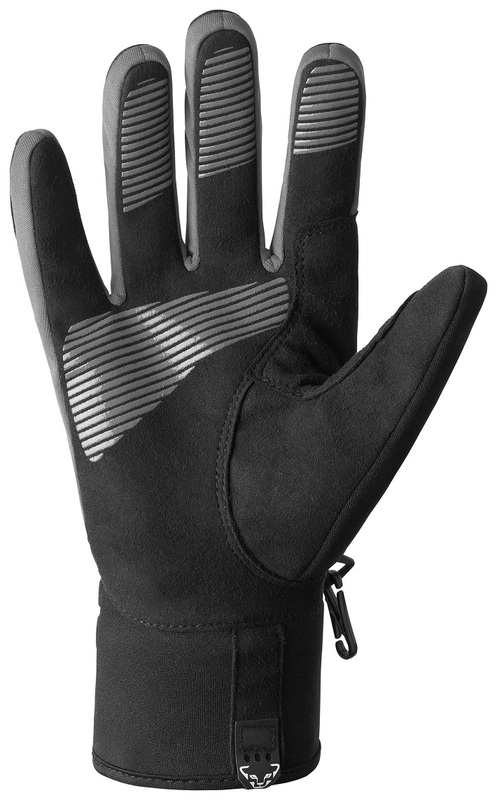 The Racing gloves are finished with a brushed interior and neoprene cuffs to keep out cold and moisture. They also look pretty cool in grey or red with the Dynafit leopard. Polarlite DYNAstretch backside is a blend of 94% polyester and 6% spandex for an anatomic flex. Chamude palm is a 60% nylon / 40% polyurethane blend that is soft yet grippy. Silicon printed Grip-zones in the tips of the fingers and the upper palm are great for holding poles. Neoprene outer cuff and brushed inside help snug the glove comfortably to your hand. Since the question above about sizing was mine, I thought I would write a quick review. Perhaps I will write another review and bump my review up one more star once a I get a few more uses out of the gloves (our PNW snowpack has been a bit slow coming). Anyway, the size large fit me great. Tight enough that I could easily strip skins and manipulate strap/zippers/etc without removing the gloves (my main goal in getting the gloves because I am weary of gloves with a sloppy fit). Paired with the primaloft over glove these gloves really shine. My first trip with the gloves was one of those 33 degree days with the snow dumping and melting all over everything. That always seems like a recipe for wet, cold hands. Despite the gloves getting soaked after an hour or so, my body heat uphill was enough to push the moisture away from my skin. The leather on the fingers and palm was just enough protection to keep stripping wet skis from being too uncomfortable. On the down, the gloves stayed warm enough (despite being soaked) coming in and out of the over gloves with each lap. So, all in all, I am happy with my purchase so far. Thanks for the advice on sizing! I am somewhat between sizes. Do these gloves tend to run large or small? Hi Jeff, these gloves use European Unisex sizing, which is fairly small compared to U.S. Mens sizing. The small is EU 8, M=8.5, L=9, XL=9.5 on that scale. In English, I fit the XL with 8.5 inch hands (both tip to wrist and around palm). This is a great glove for skimo-related pursuits. -Durability- pretty good for a wimpy looking glove. Its hard to see in the pictures but the entire palm and finger area is leather plus there is that red grippy stuff on key areas. - Breathable yet warmer than it looks- The glove is about 100 weight fleece or a light weight glove that works great in mild to cool skiing conditions. You would definitely want an overmitt for very cold or windy conditions though. Durability-wise, the leather palm makes them fairly durable for a glove like this but they are made for a very specific function and doing other things with them would likely lead to getting them torn up. Id bet that with some shoe goo they will last a few solid seasons or more. 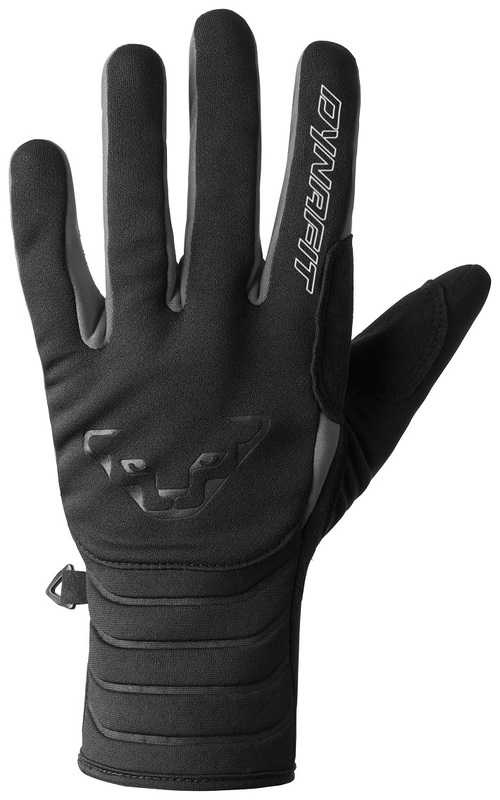 The Dynafit primaloft one pairs incredibly well with this glove (just as advertized!). One key thing is that the wrist area is long, covering the whole wrist and very well insulated. This is where many gloves fall short and end up being colder than they look. Dynafit nails this detail perfectly! -Glove to skin interface- The only criticism I can find with these gloves is that the leather palms are rough-out style and since they are black I quickly noticed black residue on my skin tails where I grab them to pull apart prior to applying them to my skis for transition to ascents. Thats an area of the skin that takes plenty of abuse so gloves that add to that are not ideal. I think smooth leather palms work better. However, skin tails have to get maintained every now and then anyway so Im not sure this does much more than slightly speed up the inevitable. A really good base component of a hand layering system for folks moving fast on skimo gear.